METTLER TOLEDO's new PowerMount™ and the proven PinMount™ weigh modules are now available with the innovative POWERCELL® load-cell technology for capacities from 220kg up to 90t. They offer higher accuracy and reduced installation costs and downtime for tanks, silos, hoppers, conveyors and other customized weighing systems. A brochure by METTLER TOLEDO presents the product range of weigh modules and explains the features and benefits for machine builders and end-users. 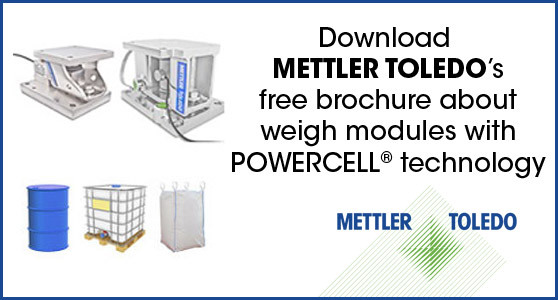 METTLER TOLEDO also offers a white paper explaining the differences between traditional analog load cells and the advanced POWERCELL® weighing technology. Weighing is the most accurate and easy-to-apply measuring method for drum-, IBC- or big-bag filling. METTLER TOLEDO created a new guideline that provides you with practical know-how to achieve the best filling results to meet your customers' requirements with high-performance equipment and fast throughput.